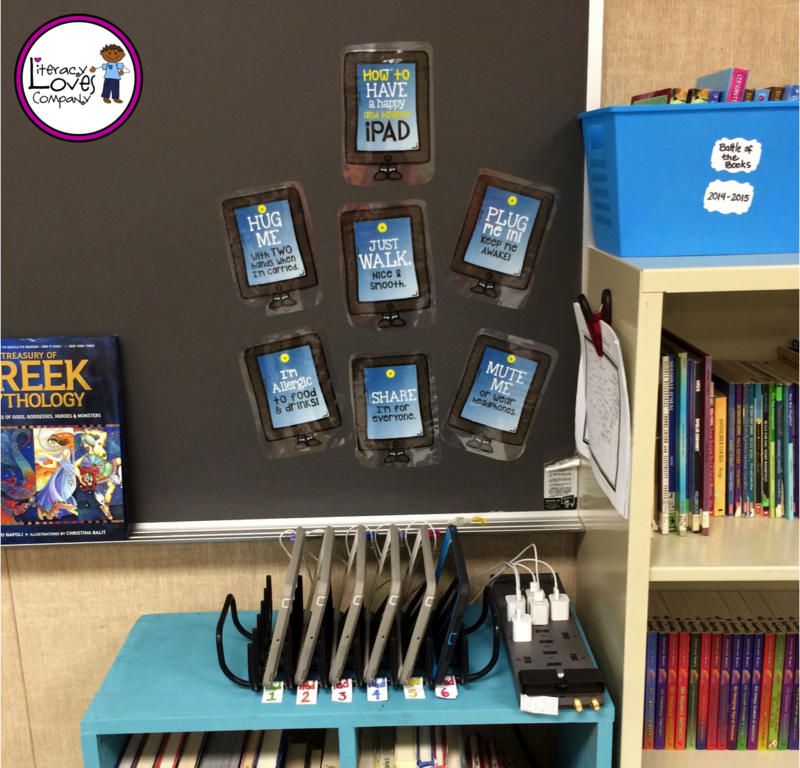 I'm happy to be linking up with Shroeder Shenanigans in 2nd and Lucky Little Learners for their #2getherwearebetter linky party! 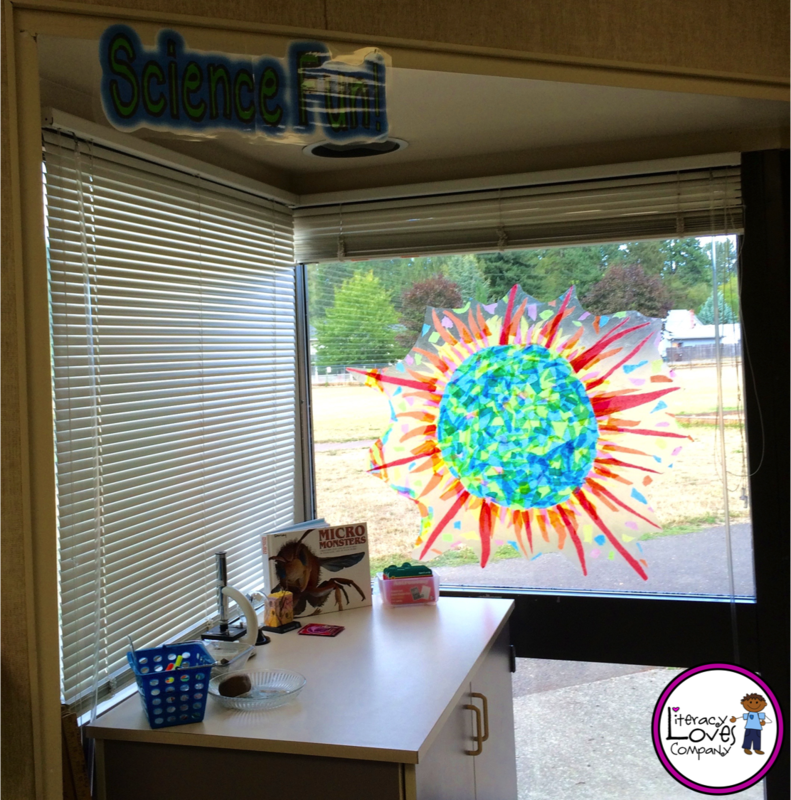 This month we are sharing CLASSROOM REVEALS! Another school year brings another chance to mix things up with my classroom decor! 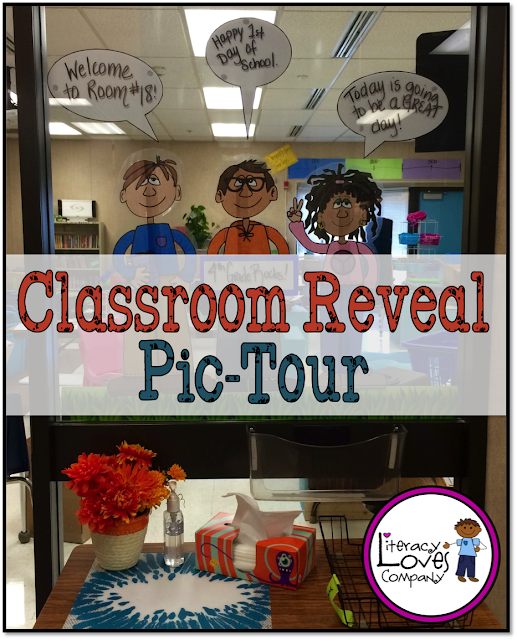 I'm excited to take you on a pic-tour of my room! Full disclosure here... 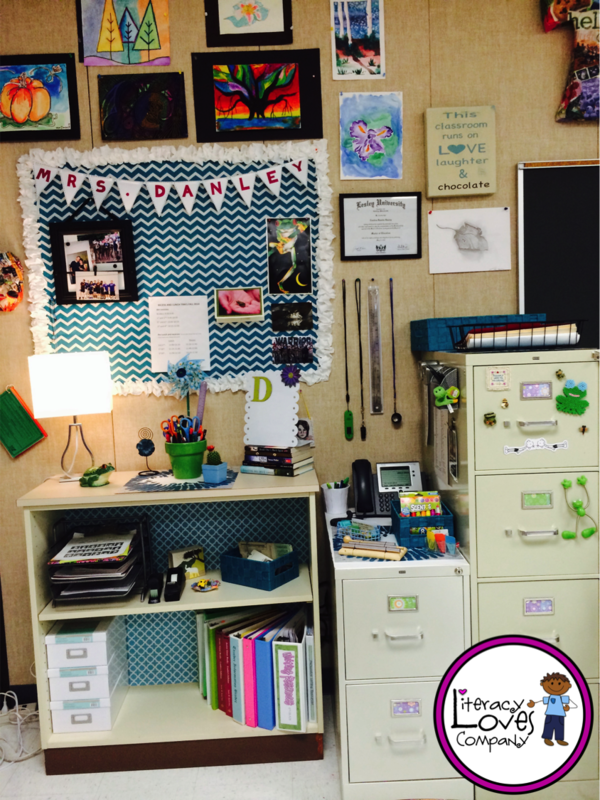 I have only been back in the classroom for about 3 days so you will probably notice boxes here and clutter there... My room is still in process. This is why you won't see a picture of the WHOLE room at once and why I am calling this "Part I". 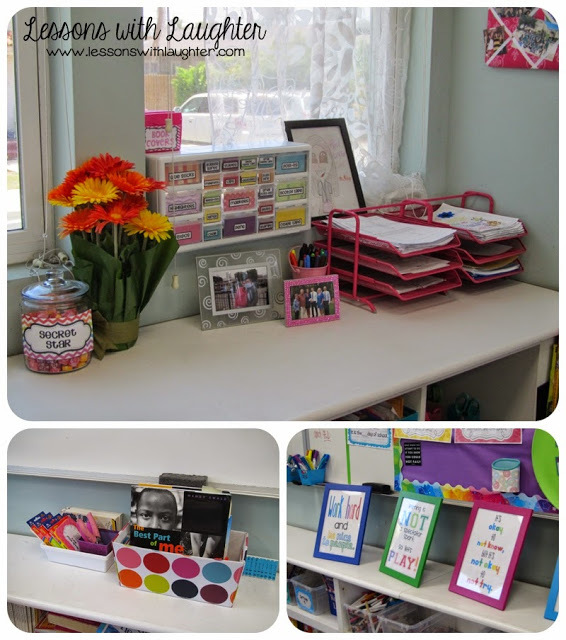 I've been working around the perimeter and am just now starting to get the student tables cleaned off, but I have some great decor and organizational ideas to share with you, so here we go! When you walk up to my classroom you will be greeted by "Bobby", "Jasmine", and Adam. These are some of my Kool Kat Kidz clip art characters. I got the idea for "blowing up" the clip art from Schroeder Shenanigans in 2nd. My goal for these three is to change up the message each day or two. Eventually, I am going to use these characters and speech bubbles to start introducing quotation marks to my 4th graders. Next up, you will find these "Habits of Mind" posters greeting students as they walk through our classroom door. 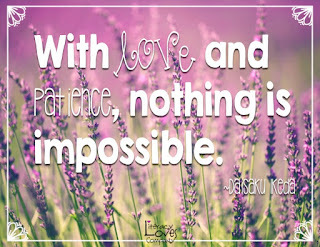 A little positive inspiration to start the day! 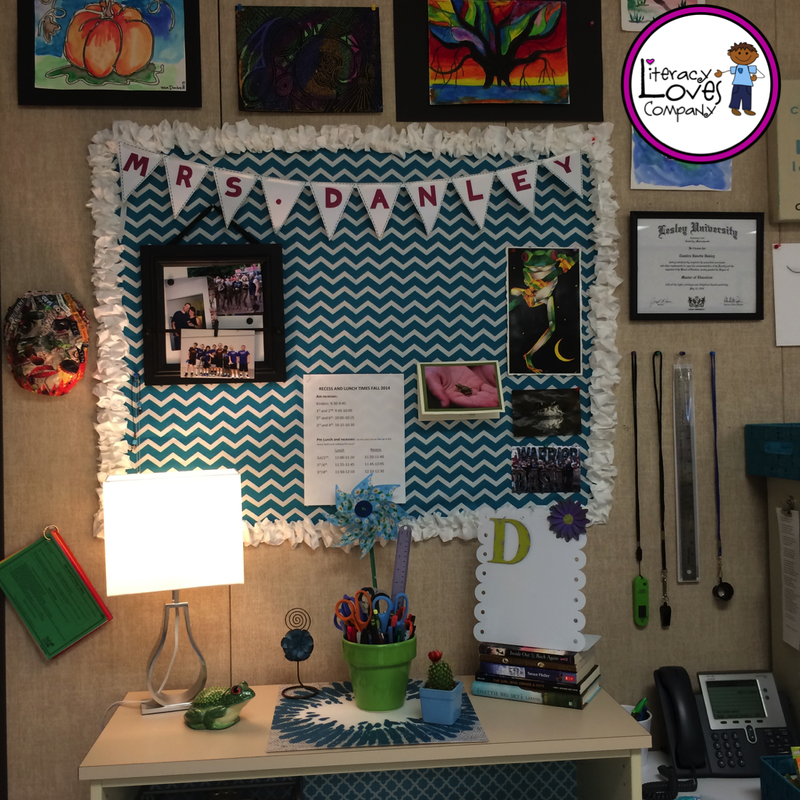 As you walk into our classroom you will see my teacher corner. Last year, I tried to give up my desk, but I only lasted until winter break. I found that, without my desk, I felt lost and disorganized. I don't sit at it much, but at the end of the day, I love my corner. This year, I added a new rug and a few new accents. I finally purchased a rolling cart from Ikea! I love it and think that it will be very useful as I work with students in different parts of the room. 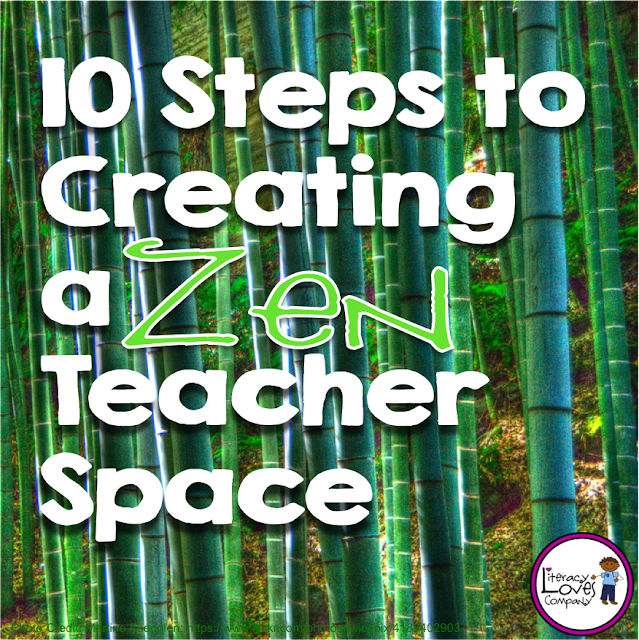 In my blog post, Ten Steps to Creating a Zen Teacher Space, I talked about some simple ways to create a peaceful area in your classroom that you'll love! Next up is the classroom library. Can you tell I love books? I organize my class library by genre. 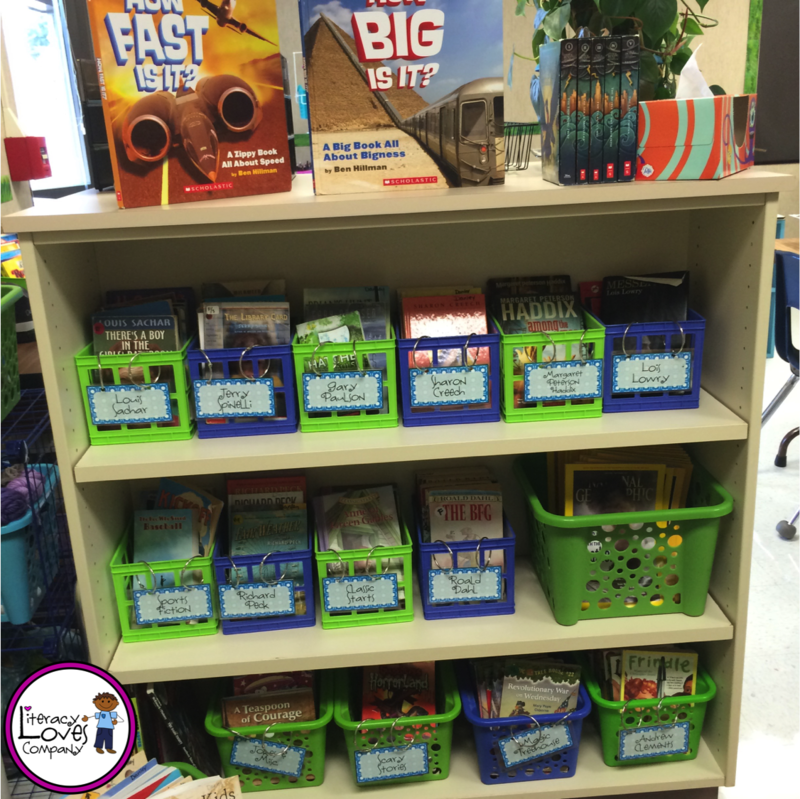 I also pull some groups of books by the same author and create some author baskets. 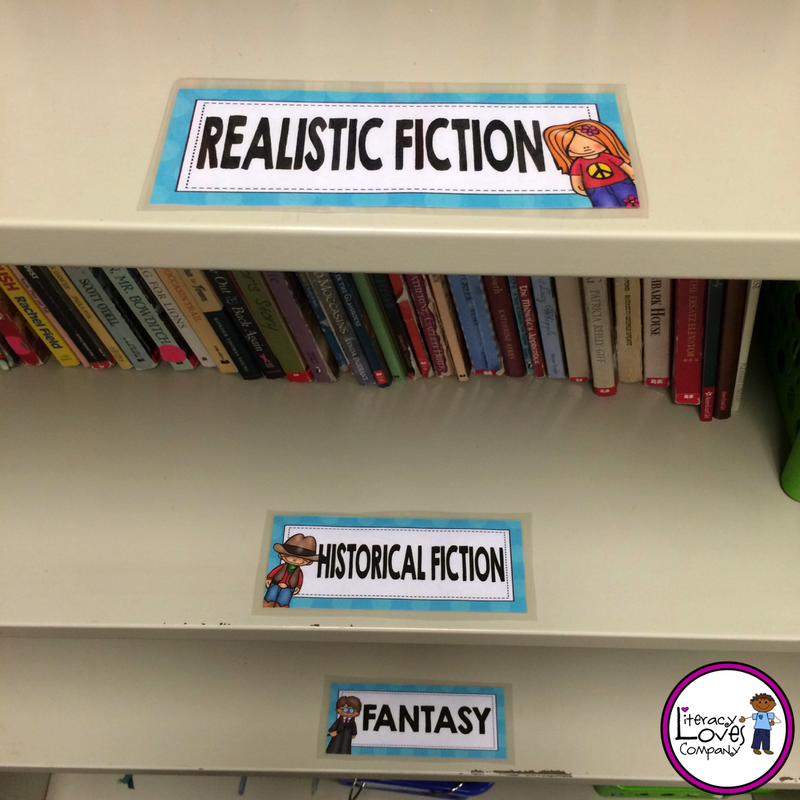 I add anchor charts, created with the students, to the wall throughout the year. The next few stops on our tour are a few stations I have set up throughout the room. Here you have the writing station. I have some reference materials, different kinds of paper, greeting cards, and story starters all gathered for students to use. This is my science station! I have a small microscopes and several items for students to explore. The objects can be changed up as the seasons or units of study change. 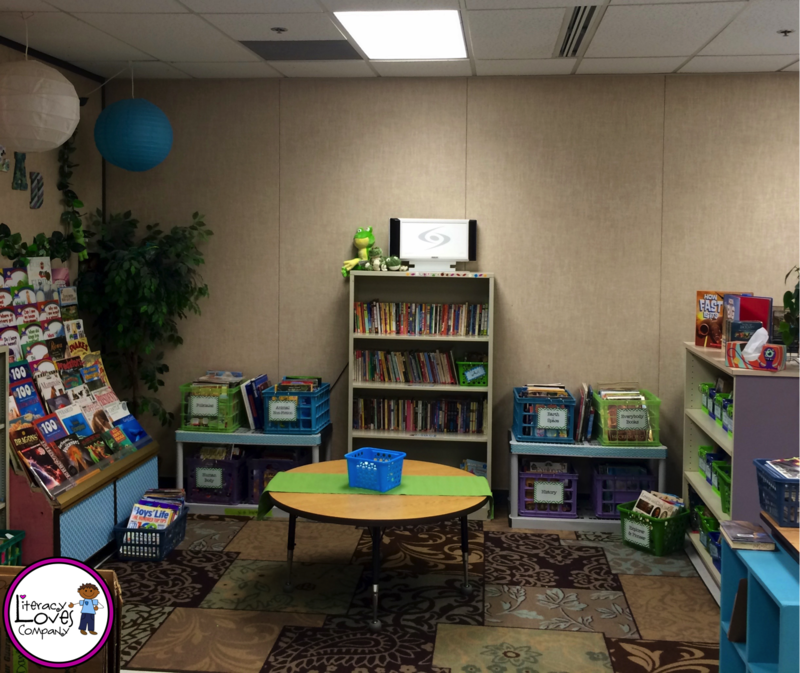 This area of the room is for community supplies and math materials. I organize my colored pencils and crayons by color. This makes it easy for students to find a certain color. 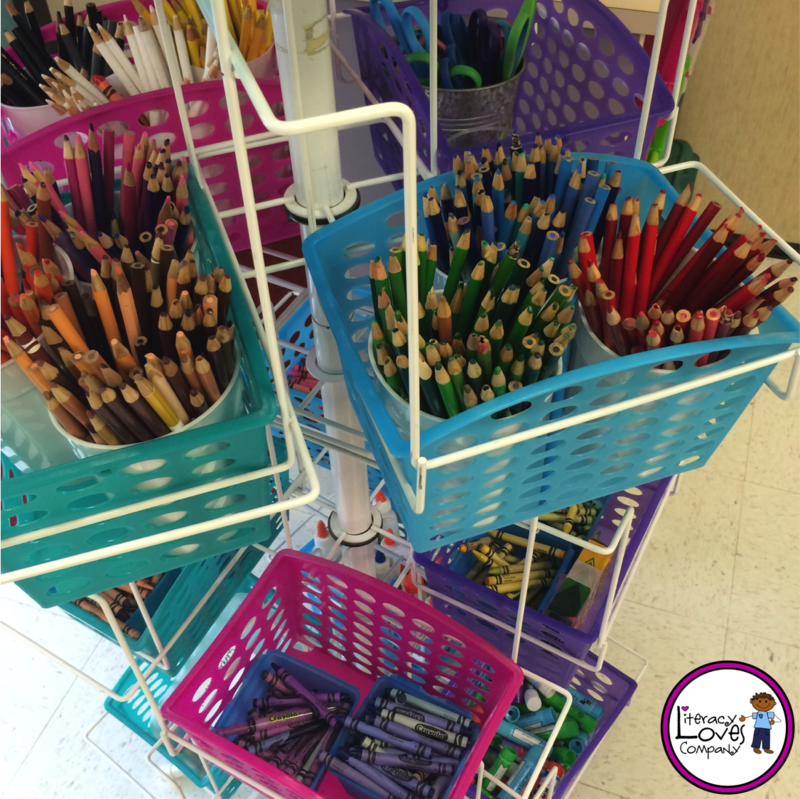 They don't have to dig through a big container of pencils for a blue pencil. Great time saver! I used this little Ikea dish drainer to create a little charging station. Last up, we have my math wall. I got the idea for this great board from The Teaching Sweet Shoppe! 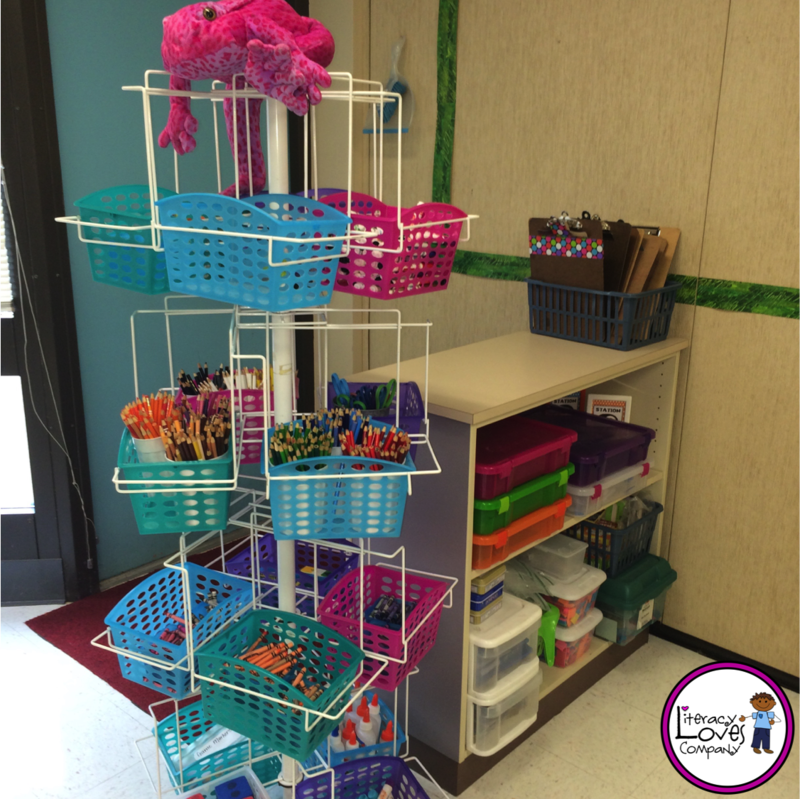 Last year, I started math workshop with my students and loved it! I can't wait to start it with this year's group! My board isn't finished yet. I've left space for math objectives, vocabulary, etc. 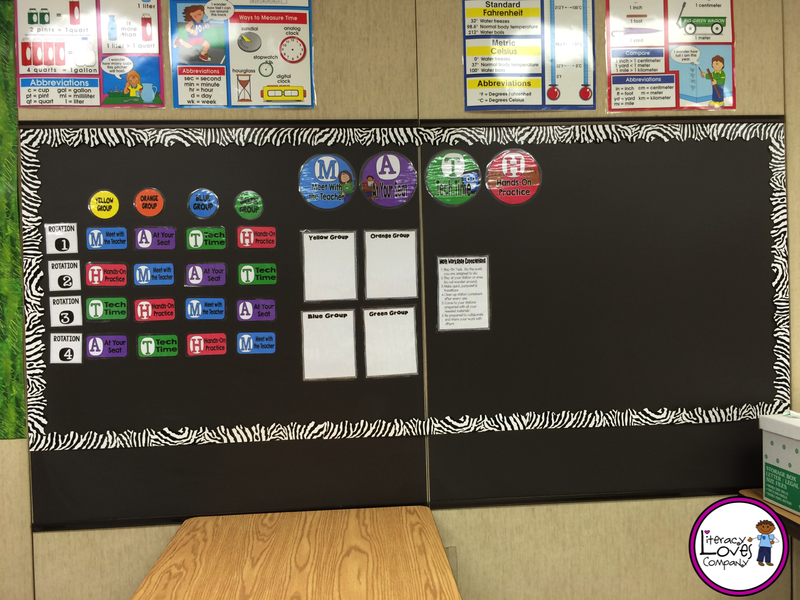 This board is located on a magnetic blackboard. I've used magnet tape to mount all of the parts of this set. This makes it very easy to move things around. That concludes our pic-tour! I hope that you found an idea or two that you can take back to your own classroom. Check back soon for Part II! I'll be sharing my student cubbies, table set up, and first day packets! It's lunchtime and you've just seen your students off to the lunch room. 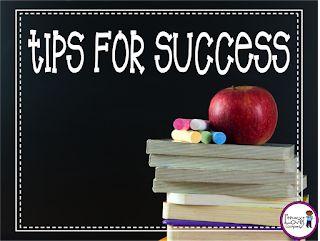 You quickly prepare for your next lesson, answer a few e-mails, and maybe even grade a pile of papers. Oh, wait! You still need to eat lunch! You head to the staff room, grab your lunch, and search for the microwave. Ah Oh! There's someone's ravioli rotating in the microwave and a line three people deep waiting their turn. What to do? Yep! A Crock-Pot! But this isn't your momma's crock-pot! This is actually a mini crock-pot specifically made to heat up small portions of food. The pot hold 20 oz. which is an ample serving. There is an inner liner/container that is removable. I usually keep the base at school and the liner travels back and forth between home and school. The crock-pot is perfect for soups, stews, pasta, and almost any leftover. I plug mine in when I get to school in the morning and by lunch time my food is nice and hot and ready to eat. No more waiting in line at the microwave. Big time saver! 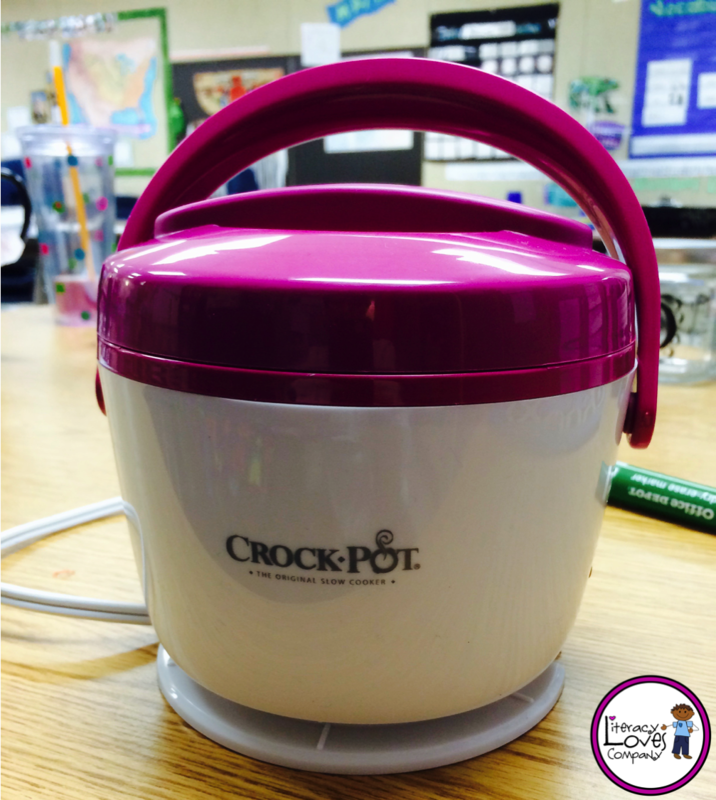 At the time of this post, the crock-pot pictured above was selling for $19.94! Well worth the money for the time it will save you each day. By the way... Crock-Pot is not paying me to say any of this. I just want to share with you all a tool that has made a time saving impact on my day. It has been such a blessing to know that my lunch is going to be hot and waiting for me when I am ready to eat. 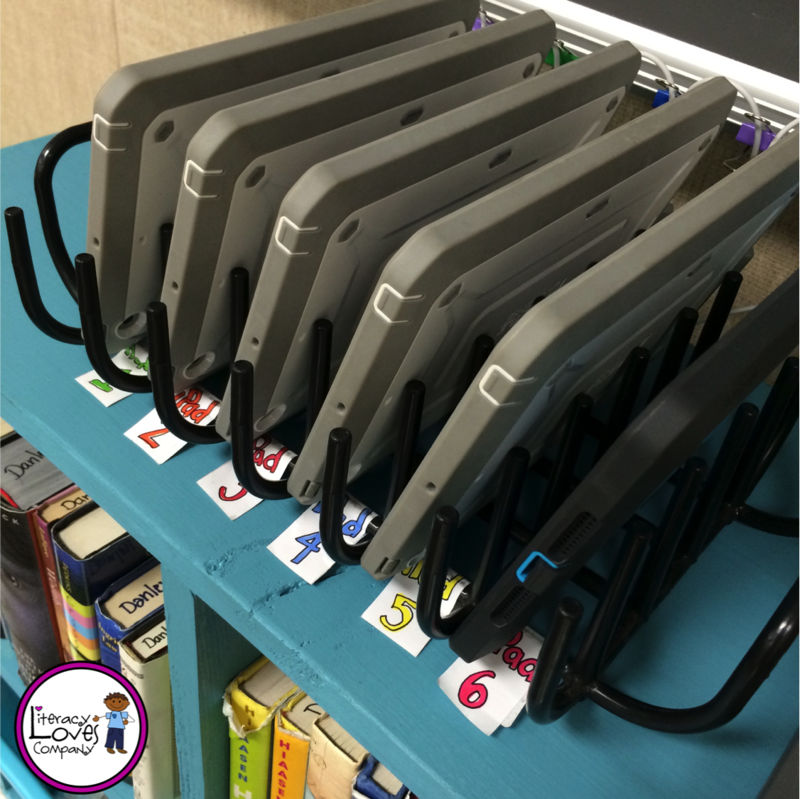 So that is my Teacher Time Saver! Please check out the blogs linked below for more tools, tips, and products to add minutes to your busy day! 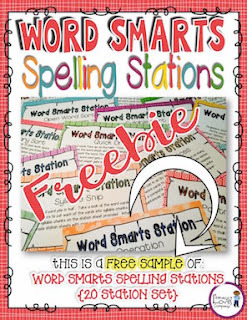 Looking to save time on your spelling station prep? Check out my Easy Prep Spelling Stations. 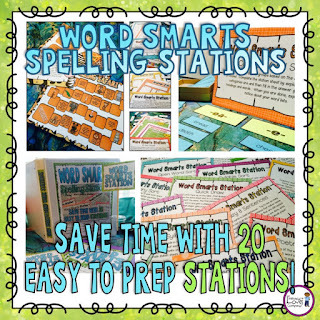 20 Stations including word sorts, activities, and board games. Includes word lists! Download the FREE SAMPLE from my TpT store. Click on the pic to be taken to the product descriptions. 1. 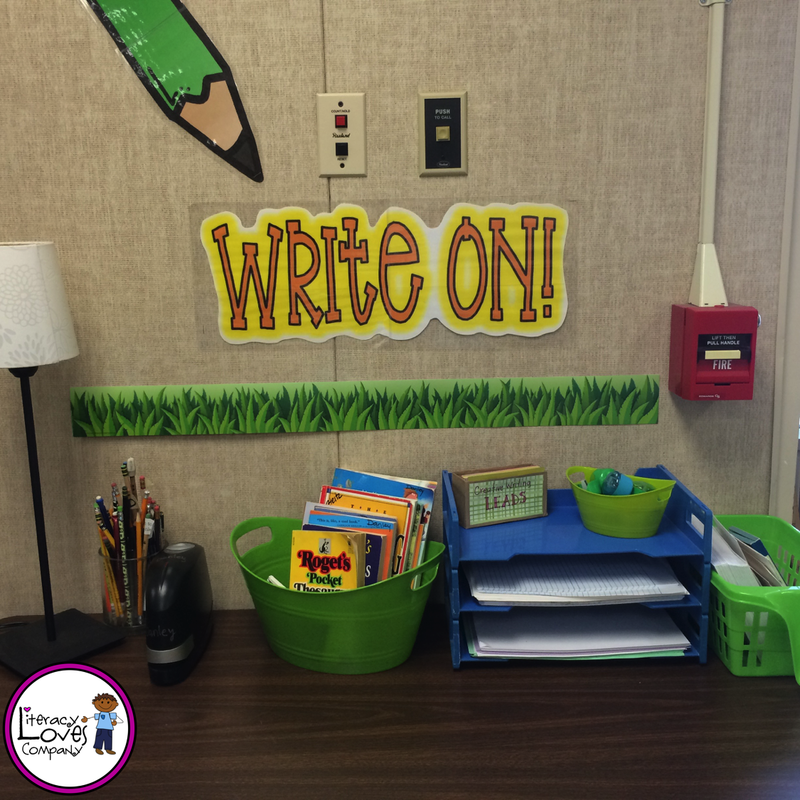 Write a blog post featuring a Teacher Time Saver. This could be a time saving tip, tool, item, or product. 2. Grab this graphic and add it to your post. 3. 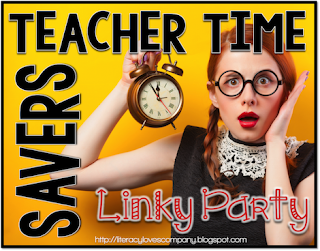 Mention, in your post, that you are participating in the Teacher Time Savers Linky Party hosted by Literacy Loves Company with a link back to this post. 4. Make sure you have a "pin-able" graphic in your post so that others can pin your idea. 5. Use good linky party etiquette by commenting on this post and by visiting and commenting on the two blogs linked before you and the one after you on the link-up. Please advertise your blog posts on social media. 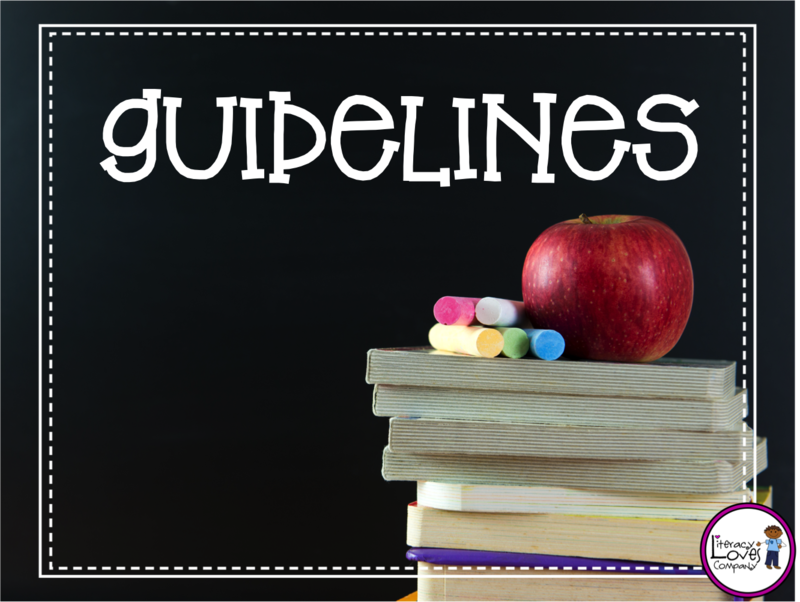 Thank you for following the guidelines above! I will try to visit each of your blog posts. I'm looking forward to learning about new ideas to save me time this school year! The linky party will be open through September 2015. 1. SIT IN A CIRCLE. There are a lot of reasons why sitting in a circle is beneficial. In a circle, no one is in front, in back, first or last. There is nowhere to hide and everyone in the circle is on equal ground. 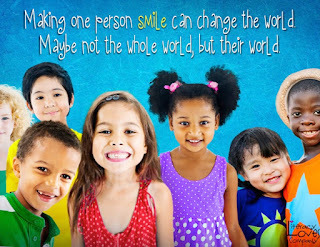 Everyone should be able to see everyone else's face. Have this clear line of sight makes it easier to attend to what other people are saying. Students are more apt to participate when they are in a circle, because they feel like they are part of the group. Because my class size is so large, my students sit in two concentric circles. One group sits around the edge of the carpet and the other group sits in chairs on the outside of the carpet. When I taught fifth grade, one of my teammates didn't have a carpeted area. 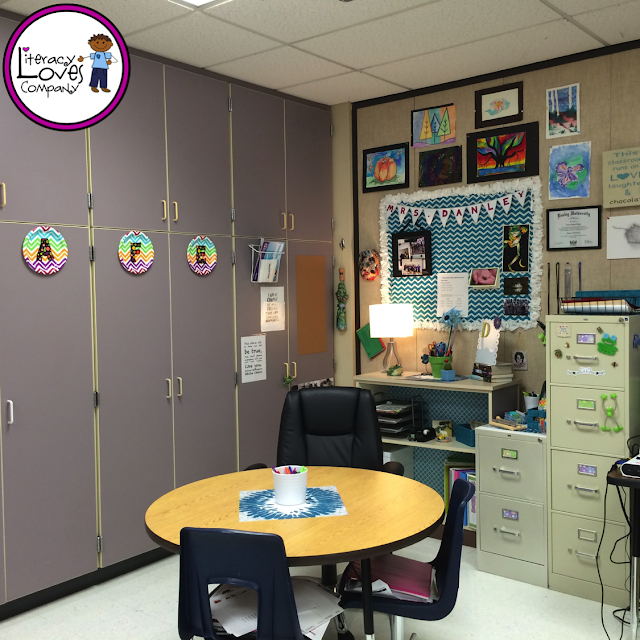 Instead, she had her students move their chairs to create a circle in the room. Everyone has the right to pass. Accept and Respect each other's comments. If we disagree, we respectfully disagree. Wait your turn to talk. 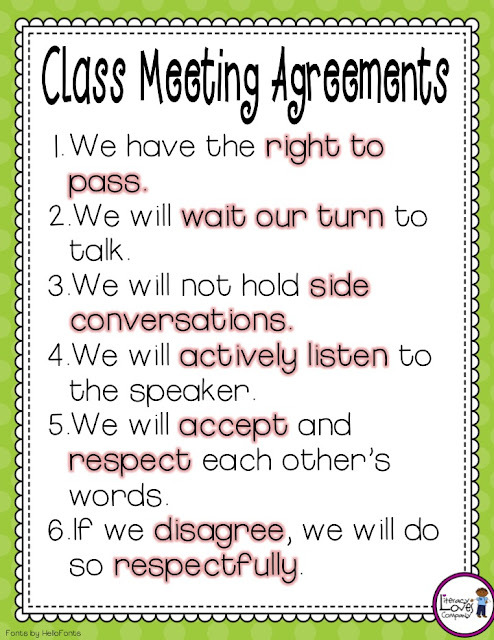 Before each meeting, I remind students of the rules/agreements. It's a good idea to make a little sign with the rules on it (or download the one below). Number the agreements and when someone is not following them, all you need to do is point at the sign and hold up the number of the agreement. These silent signals are less disruptive to the person speaking. Grab your FREE download HERE! 3. USE A "TALKING STICK". Pass around an object to indicate who's turn it is to speak. You could have the same item that you pass around each time, for example a "talking stick", or it could be something different. I have a lot of fun items that I pass around. The student who has the item is the speaker for that moment and everyone else should be focused on that person. 4. EXPECT EVERYONE TO PARTICIPATE. This includes you, the teacher! I expect everyone to participate, but I don't force them to. The first meeting agreement is "Everyone has the right to pass." This means that if a member is unable to think of something to say, he/she can pass so they have more time to think of a response. When everyone else has participated, I always check back in with the "passers" to see if they have thought of anything they want to add to the conversation. I usually get 100% participation this way. What is really magical is when those students who don't talk much... You know the ones, the super shy ones or students who struggle with language, start sharing! It is a wonderful thing. During the weekend check in, I ask the students to share ONE memorable thing about their weekend. This could be good memorable or bad memorable. Students share all sorts of life events: birthdays, new pets, family vacations. This is also a time when students might share some sad news like illnesses in the family, the loss of a pet, or personal illnesses. There is a lot you can learn about your students from this short sharing time. 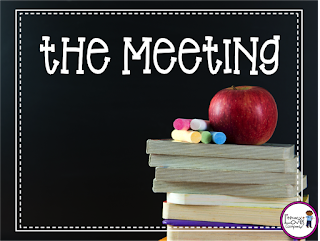 Tip for success: Because of the limited amount of time for your meeting, tell students to share 1 thing in 1 sentence. My students got good at using run on sentences to share everything they did and it took a lot of time to get through the entire class of 34 kids. The 1 and 1 Rule should help with that. While you have your students all together and their attention is on you, its a good time to quickly share any announcements. During this time I usually have a quick character education, conflict resolution, or friendship lesson. I also do group bonding activities during this time. 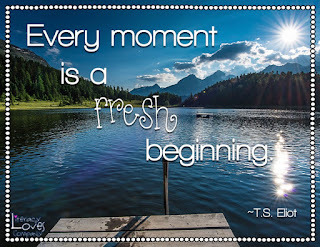 Throughout the year the theme of the lessons change. 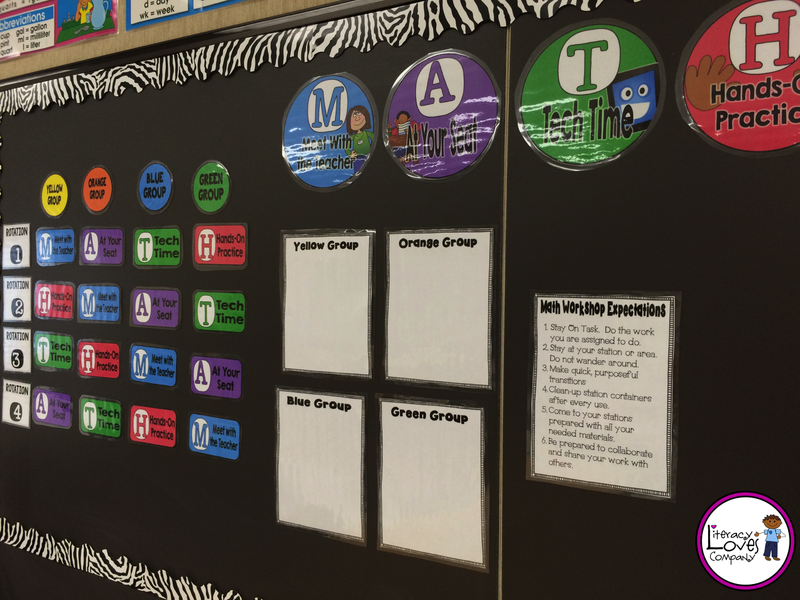 At the beginning of the year, there are a lot of get-to-know-you activities, classroom routines and procedures lessons, and class expectation lessons. 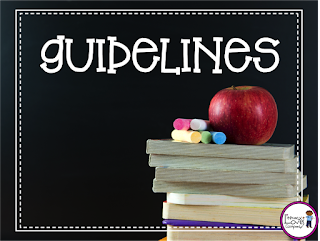 As the year goes on, I incorporate lessons on topics such as tattling, bullying, or anything that is going on in class at that time that needs addressed. For the Good of the Order - This is the time when students share any issues or problems they are having with the running of the class, peer issues (no names), concerns about class routines, organization, etc. Students bring up a lot of different problems during this time. Students might have a concern about other kids not pushing in their chairs, clean-up jobs not being done, or questions about an assignment. I love this part of the meeting because, throughout the week, when I have students come to me with a class issue (non-urgent), I say, "That would be a great topic to bring up during our class meeting." This puts the problem in the hands of the students. When a problem is brought up during the meeting, I don't give the students the solution. I ask the group to come up with their ideas for how we should handle it. Once again, I am putting the responsibility of problem solving back on them and letting them take ownership of situation. Students share possible solutions and one is decided on. We usually agree as a class that we will try the solution for a week and see how it goes. We can bring it up at the next meeting to discuss if the solution wasn't successful. 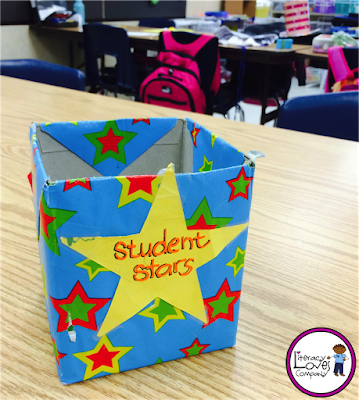 In my class I have blank star die cut shapes available and throughout the week, students can anonymously dedicate a star to a classmate who has done something positive like help another student, work hard on an assignment, or shown lifeskill that we are working on. On the stars, they write the names of the recipients and what they are receiving the star for. Toward the end of the meeting, I always read and hand out the stars. You don't have to do stars in your class, but some positive peer interaction or recognition is a wonderful way to build community in your classroom. Instead of stars you could do a compliment circle or appreciations. I usually end the meeting with a quick closing activity. This is usually a once around the circle with an open ended question. We like to play "This isn't a __________." To play, you pass around an object like a Kleenex. The first person says, "This isn't a Kleenex, it is a ____________." Maybe they say it is a hat and put it on their head. They then pass it to the next person. That person says, "This isn't a hat. It's a _____________." and then they pass it on to the next person. Play continues around the circle. This is a fun game that get kids using their creativity and imagination. And it is fun to see who your "out of the box" thinkers are. As you can see, class meetings are a positive, fun time for you to build a rapport with your students and help them connect to each other. I can't stress enough how important it is that students are respectful of one another and support each other during this time. 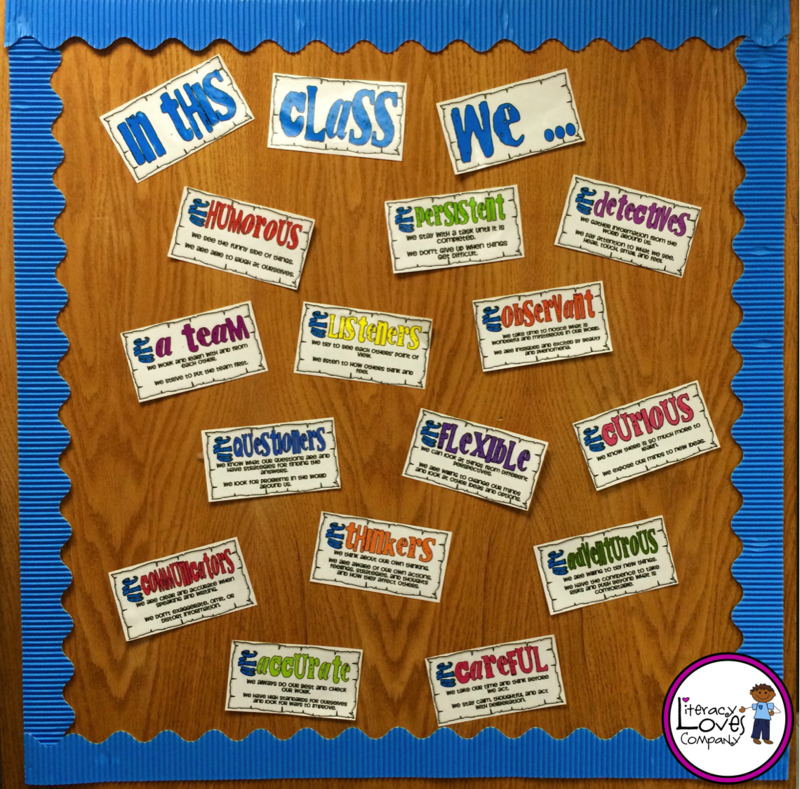 A lot of sharing happens during a meeting and we want students to feel safe and supported as they share with you and their classmates. Model by example - Be Positive. Be involved. Show interest. Encourage participation. 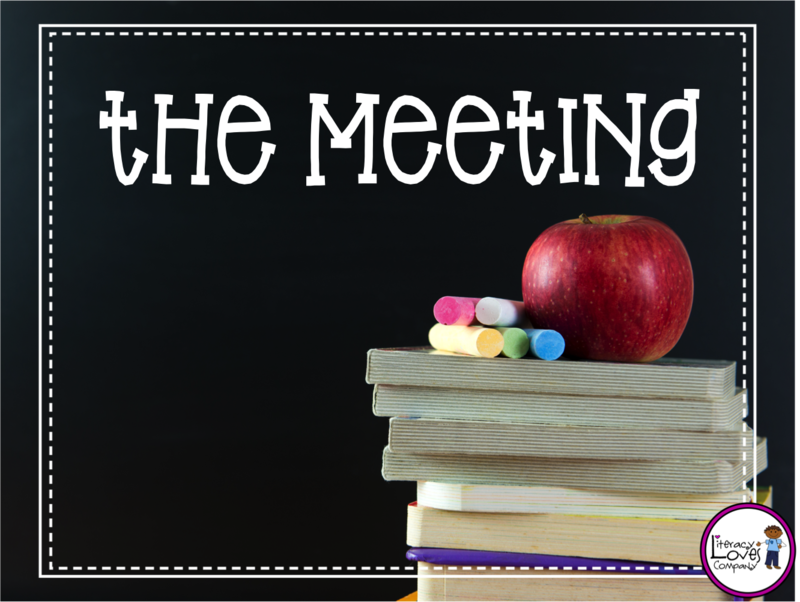 If a student is struggling with being a positive member of the meeting, talk with him/her privately at another time. Don't let your meeting run too long. Mine last about 30-40 minutes depending on the lesson for the day. Keep the meetings fun and engaging. If needed, schedule in a movement activity. Be consistent. Have the meeting the same day every week. Same place, same routine. Save the community circle for your important meetings. The weekly meeting is important. If something else comes up in class and I ask students to meet me in the community circle, they know we are meeting to talk about something important. 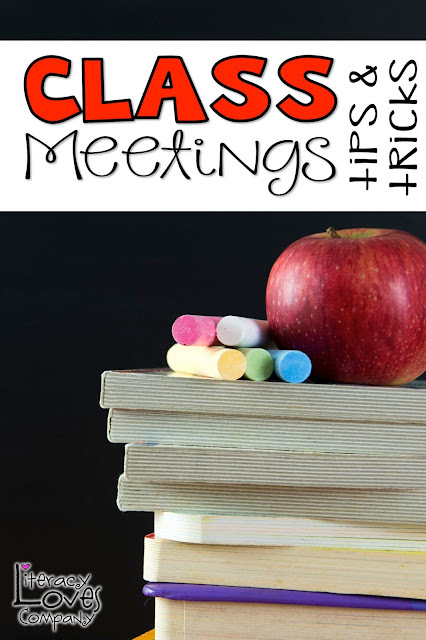 I hope that this blog post has given you some ideas to help you start your own weekly Class Meeting. In my opinion, it is one of the most important things you can do to build a respectful, supportive community of learners in your classroom! If you have any questions or have more ideas or suggestions for creating a successful class meeting, please share in the comment section! I'd love to hear from you! Are you following me on Bloglovin' yet? Hey Teacher Friends! I'm excited to be part of the Upper Elementary Back-to-School Blog Hop! 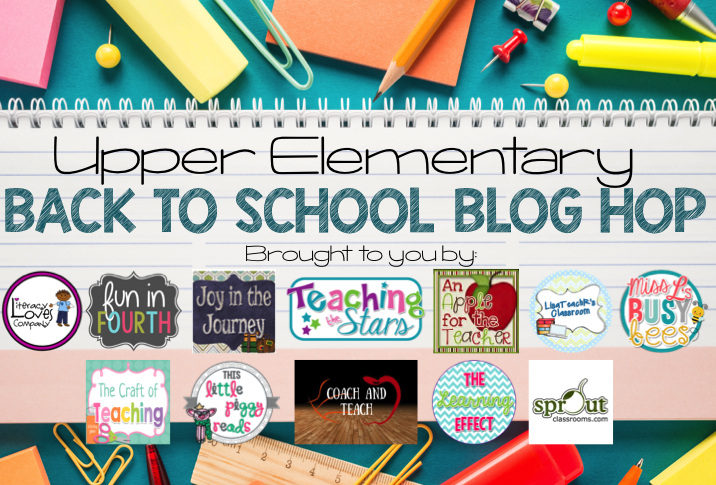 We have some great BTS tips, freebies, and several chances to enter to win TpT gift cards just in time for back to school! ... and it just keeps getting busier. Sometimes even the teacher needs a time out. is a must to keep your mind and spirit in a positive place. 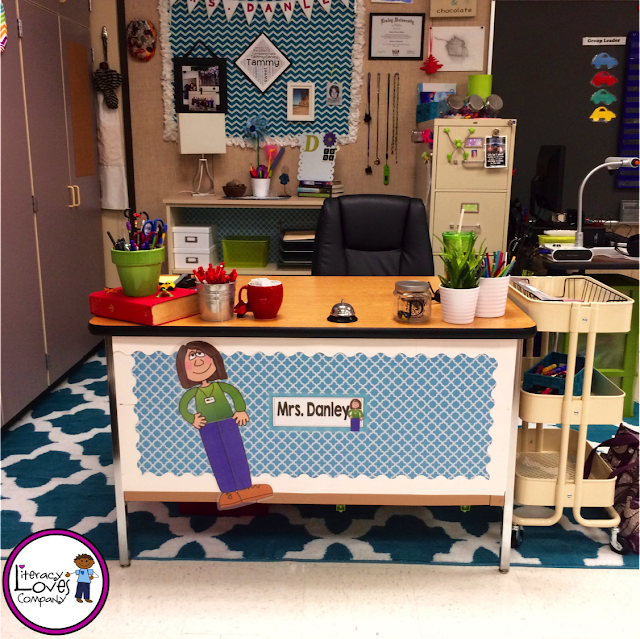 Here are 10 easy steps to help you create a little peace and serenity in your own classroom! 1. KEEP IT SMALL. Your Zen space doesn't need to take up the entire corner of your classroom. 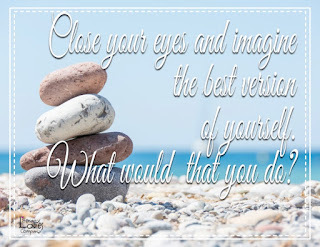 Mine consists of a small bulletin board space, a bookshelf, and my desk. 2. 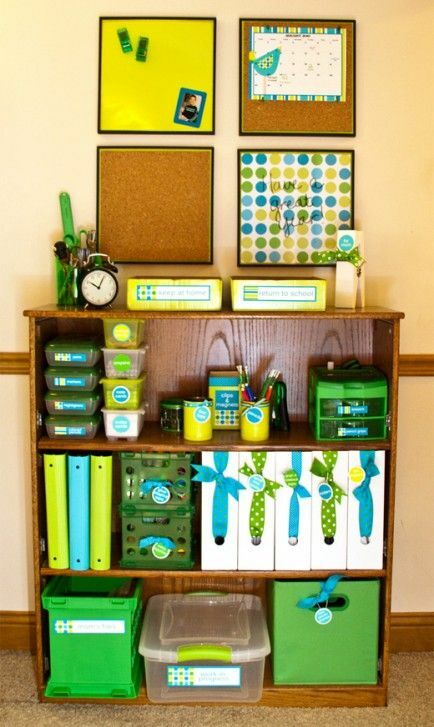 ADD COLOR - Choose colors that you personally find calming. It doesn't matter if it matches the rest of your room. This is YOUR space, make it pleasing for you. The most calming colors tend to be in the blues and greens. 3. PICK LIGHTING - Buy yourself a lamp with soft lighting. I bought mine from IKEA (pictured below) and love the shape of the base and the lampshade. 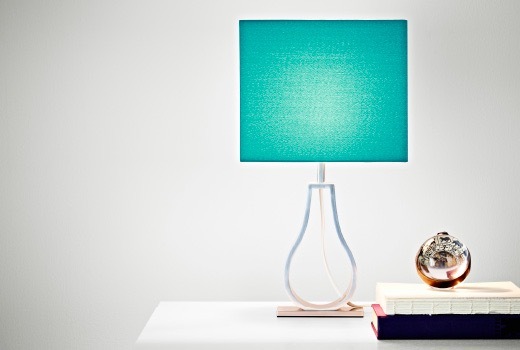 Your lamp could almost be considered an art piece, so pick one you love. 4. SPEAKING OF ART.. Pick a few pieces of art that you find visually pleasing. Even small postcard sized pieces are perfect. 5. 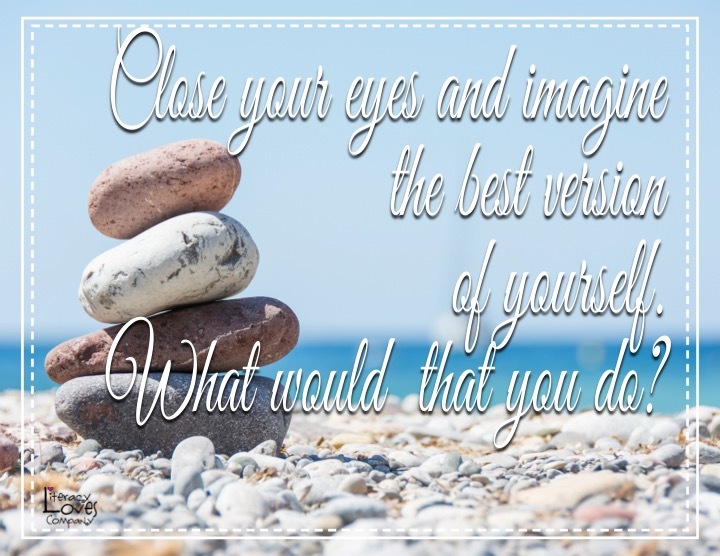 ADD A QUOTE - I love to put quotes in my space. 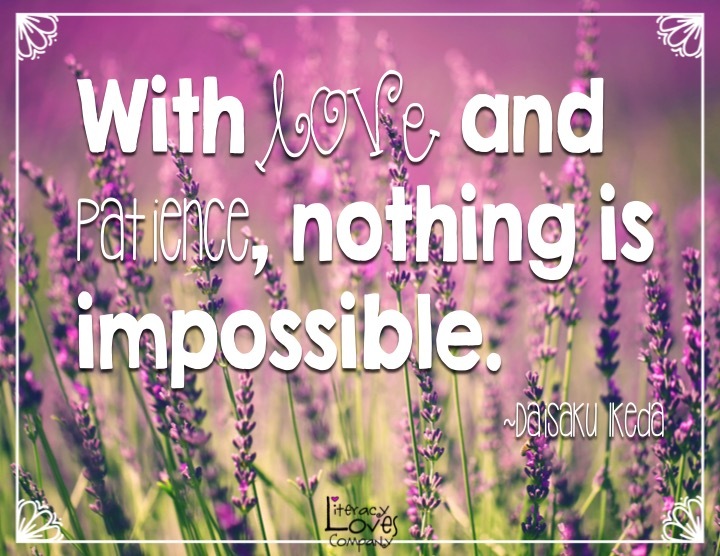 When I get frazzled or have a bad day, I can go to my zen space and those quotes, surrounded by the other elements, help to center me. 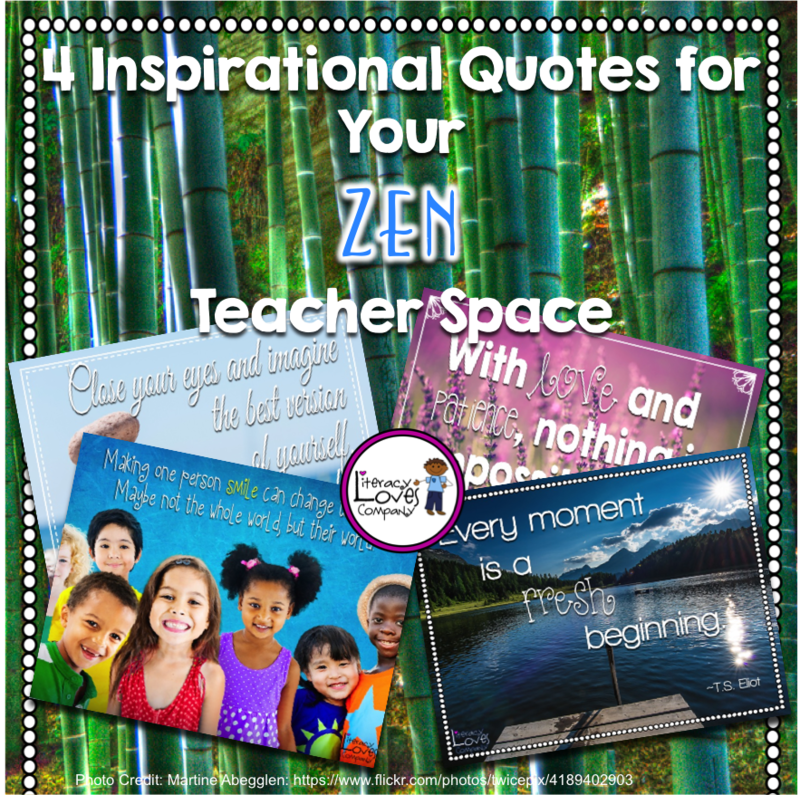 Enjoy this FREE DOWNLOAD of the above 4 Quotes for your teacher space! 6. TRANQUIL MUSIC - Before school, after school, lunch, whenever you need a moment of peace, play music you love. I have a playlist on my phone titled "Easy Listening" that I have stored my favorite soft music. I have also used Pandora and have many CDs with soothing music. 7. OTHER SOUNDS - Consider other sounds that you find peaceful. Maybe add a set of chimes or a small desktop fountain to your space. The sound of water is one of the most soothing sounds there is. 8. CALMING SCENTS- Smell is one of our strongest senses. Scents can trigger emotional responses and memories. Different scents have different affects. Using citrus scents such as lemon or peppermint can help focus attention, while lavender is a more soothing scent. 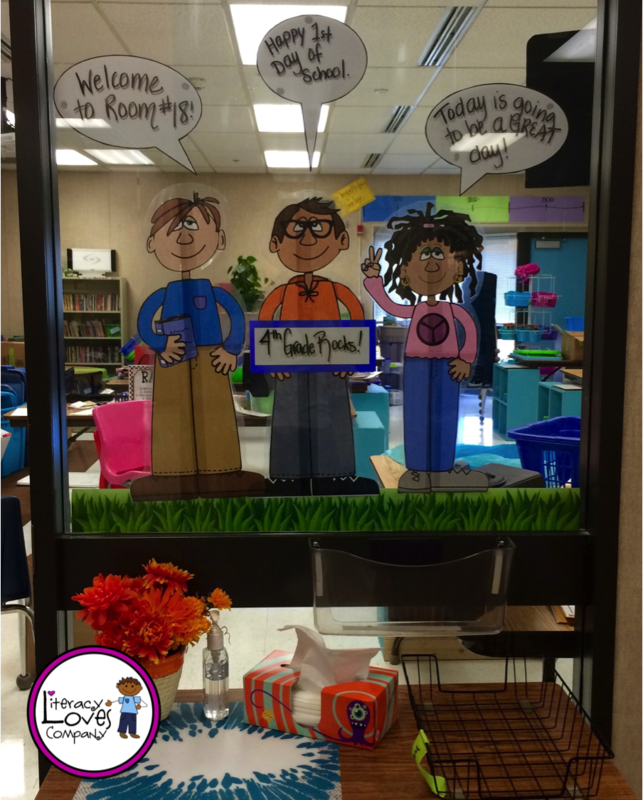 There are many options for keeping your space and classroom smelling good. One is to use plug-in air fresheners like Glade or gel-type air fresheners like Renuzit. You could also use different essential oils. Essential oils can be used in diffusers or simply drop a little on a cotton ball. Be careful with scents, however. Some students and adults are sensitive to smells, so use them lightly. 9. 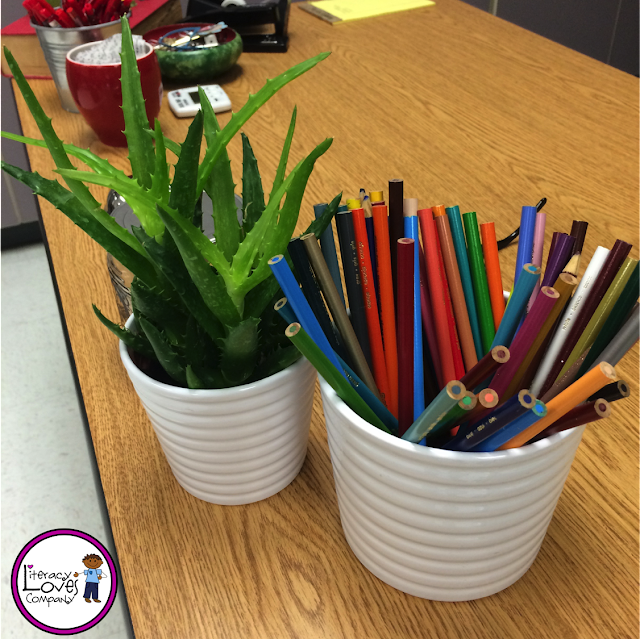 GO WITH GREENERY - Bringing a bit of nature into the classroom and specifically into your teacher space can be very calming. Plants don't have to be a lot of work. There are many plants that do well in the classroom. 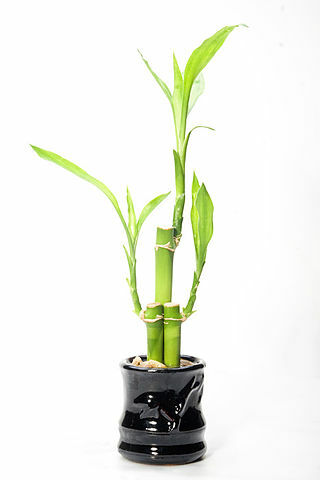 Some examples are bamboo, pothos, ferns, ficus, jade plants, and spider plants. At the end of each day, I set my timer for 10 minutes and devote that time to cleaning and organizing my space. You can get a lot done in 10 minutes. If you don't have 10 minutes after school, do it before school, a few minutes in between classes, etc. 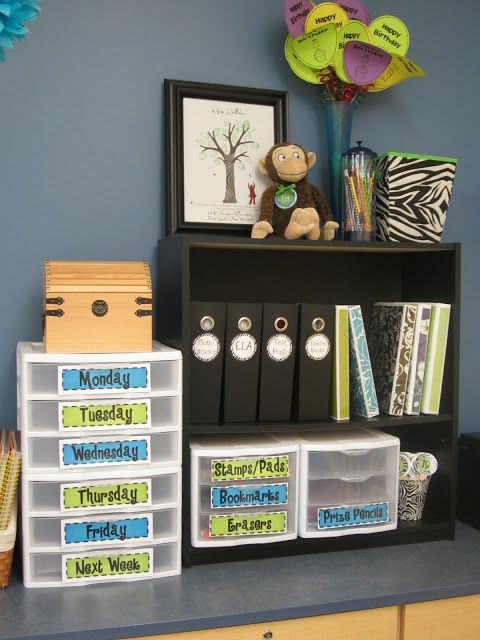 The goal is to not let the papers, post-it notes, pencils, and paper clips pile up. The clean, clutter free surfaces are very calming. It didn't always look this way, but it is my goal this year to take control of my clutter and keep this space free of piles. I love the use of space in this set-up. Putting a small shelf on top of a counter is a great way to utilize your vertical space. 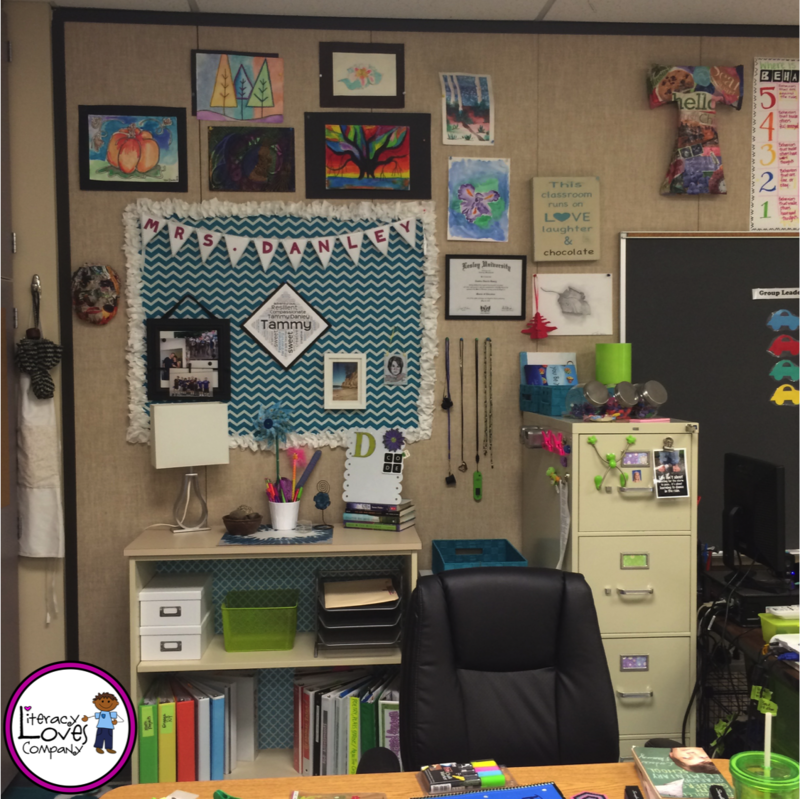 I hope this post has inspired you etch out a little corner of tranquility in your classroom! 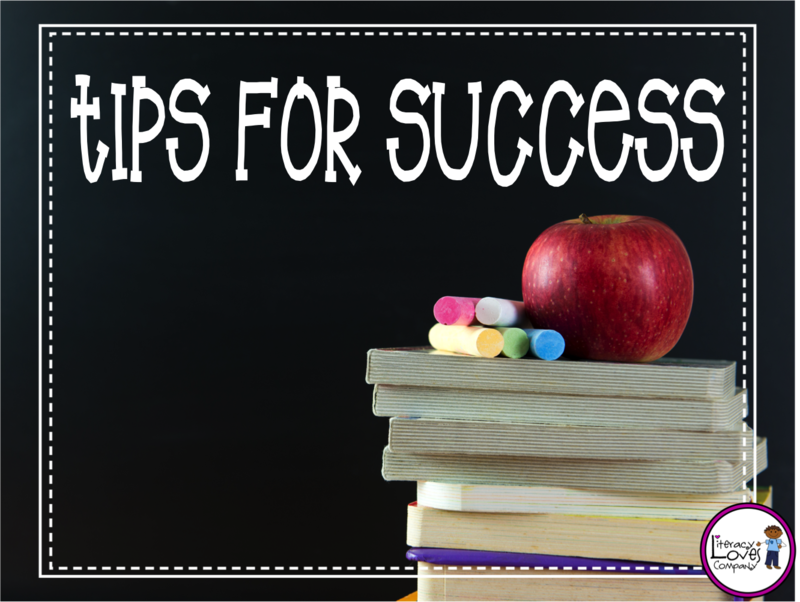 For more great Back-to-School tips, freebies and chances to win, continue on the blog hop! 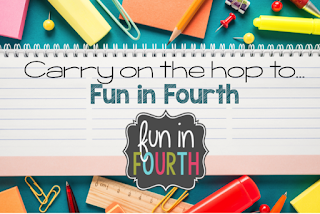 Next stop is Fun in Fourth! 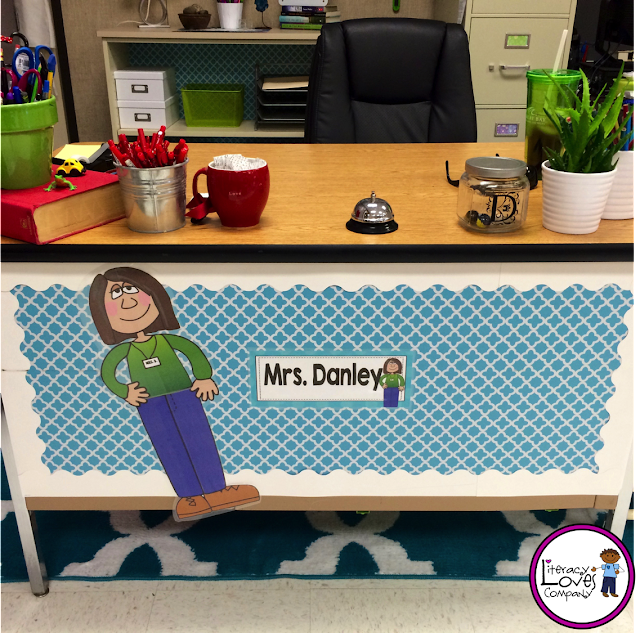 She has some great tips for planning for the first week of school and setting up your classroom routines for success! 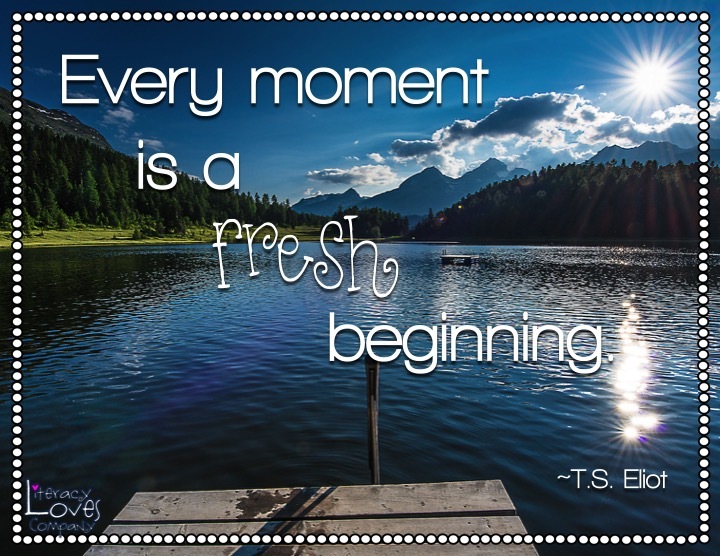 Before you go, don't forget to enter to win one of several TpT gift cards. You could win a $10, $25, or $50 dollar gift card! To enter, please click to follow my TpT store! You'll not only be entered into the giveaway, but you'll also get notifications of any new resources I add to my store. All of my new products are 50% off for the first 2 days! It's a WIN-WIN!